Secret Farm: A garden blog: Monarchs released! 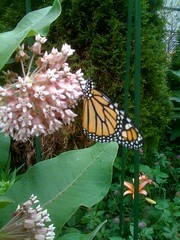 This is one of the 3 Monarchs we had that made cocoons on the same day, and came out on the same day! Unfortunately, they came out early in the morning on July 4th and when we got up and saw them we didn't have time to get more than a few iPhone shots of them before we had to run off to a parade. Oh well. We've got another one getting close to making a cocoon now, perhaps it will come out when we have more time to spend with it! When Twittering, try to experiment with both moving your attention to positive thoughts or into the present moment. Various people find either one or both is easier to accomplish. The one idea is to slide your mind out of the anxiety rut and get you back into your natural flow.